The General John Stark Scenic Byway is a closed loop route connecting the towns of Goffstown, Dunbarton, Weare and New Boston, New Hampshire. Incorporated on June 17, 1761, Goffstown is named for Colonel John Goffe, an early New Hampshire settler, soldier and civic leader. Goffstown was originally known as Narragansett #4, and was given in 1734 to those who had fought in King Phillip's War as payment for their services. The first settlers in the 1700s found the area forested with hardwood on the hill and stands of white pine on the "pine plains" which extended along Mast Road. This area was so named for the many pine trees suitable for ship masts which were cut and hauled to the Merrimack River for use by the Royal British Navy. [The famous "Pine Tree Riot" of 1772 took place nearby in the town of Weare, and included some residents and former residents of Goffstown]. The early economy of the town was based on timber and agriculture, and the mills related to those industries were eventually replaced by factories producing woolens, bobbins, and window sashes. In time, the mills closed down, but the area remained a popular place to live and raise a family. Goffstown was one of New Hampshire's earliest tourist destinations with grand hotels and an incline railroad on the Uncanoonuc Mountains. Today, residents and guests can still enjoy the natural beauty as well as the historic charm of Goffstown. 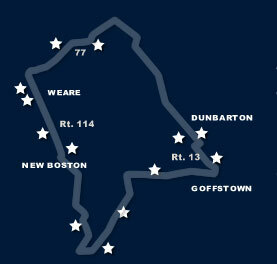 Goffstown has three distinct areas: the Village, Pinardville, and Grasmere. The Village, located in the western section of town, is Goffstown’s more traditional New England village center. The Scenic Byway's tour provides access to the downtown Village with NH 13 running through the heart of it along Main Street. The more urban Pinardville is located along Route 114/114a and Manchester’s eastern border, and is home to St. Anselm College, famous for hosting many presidential debates. Grasmere, the original town center, links the Village and Pinardville. The Main Street bridge over the Piscataquog was constructed in 1928 and was designed by nationally-renowned bridge engineer, Daniel B. Luten. The pedestrian sidewalks on either side rest on large brackets, while classical fluted concrete lamp fixtures with globes are located at the four corners. The abutments downstream are from a covered railroad bridge that burned in 1976. Take a moment to pause at Rotary Park on the north shore, a great place to view the river especially during Goffstown Main Street Program's annual Giant Pumpkin Weigh-off and Regatta held each October. Goffstown Depot, c. 1880, was built on the New Hampshire central Railroad line linking Manchester and Goffstown. Goffstown’s first depot was built here in 1850. About 1880, the original passenger station was moved westward to become a freight depot, and this passenger station was built. In 1952, the passenger station was moved about 30 feet and an adjoining storefront was built on Main Street. You can visit the Depot today just off Main Street. Goffstown Town Hall (built in 1947) replaces an earlier hall, known as the Opera House, built in 1869 and destroyed by fire in 1937. The Depression and the onset of World War II kept the town from rebuilding all at once. After years of using just one floor, the town received a gift from a resident, Mildred G. Stark, and the work was completed leaving us with the Town Hall you see today. To see the last remnant of the Opera House, walk down Church Street and look for the circular building on your left. The Congregational Church was built in 1845 in Greek Revival style with huge Doric columns, but you wouldn't know it today. Two alterations in the late 1800s gave us the lovely Queen Anne-style facade. The triple stained glass central window and arch are the focal points of this structure. Peek inside for the best view of the side windows. 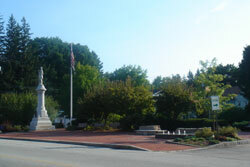 Stroll the Goffstown Town Common and Monument Square; the granite monument (shown above) honoring Goffstown servicemen dates from 1916. In 1907, the town appropriated $500 to match $500 previously received through public subscription for the “beautification and adornment” of the lot left vacant by the destruction by the fire of the Central Block. In 1916, a granite monument to honor Goffstown servicemen of all wars was given to the town. In 1999, the Common was rebuilt thanks to the efforts of a group of citizens who donated their time to create a place for the entire community to enjoy. The engraved bricks will give you a sense the people who live and work here. The Common is home to festivals and concerts year 'round. Across the street from the Common stands the Goffstown Public Library, (shown above, far right) which had its beginnings in the Town Hall. In 1907, land at the north end of Main Street was donated, and the town appropriated $14,000 for a public library and memorial hall. Dedication exercises for the Classical Revival building as the Memorial Library were held on October 2, 1909. At the annual town meeting of 1910, the name was changed to Goffstown Public Library. Be sure to visit the second floor to see the memorial tablets honoring Goffstown's soldiers. The third floor boasts wonderful views of the Village on out to the Uncanoonucs. The nearby popcorn stand (shown above), is one of Goffstown's most recognizable and beloved landmarks. Now owned by the Goffstown Lions Club, the tradition began in the 1930s when Louis Prince sold popcorn to residents and visitors further south on Mast Road. Prince sold to “Popcorn Charlie” Ray in the 1940’s who placed it here in the Village. The Lions Club purchased the cart and land in an effort to maintain the long standing tradition of hot buttered popcorn for young and old from spring to fall. Consider a visit to the Goffstown Historical Society & Museum. Open Saturdays mid-June to mid-October from 1 PM to 4 PM, the museum is in a 2-story building first used as a general store in 1804. Admission is free. Hundreds of items from earlier days are on display. An 800 sq ft room is devoted to an operational model train layout which children of all ages love to watch. Also on the grounds is a fully restored one-room school house that held classes from 1806 to 1926. To reach the Museum go 1.5 miles west of the Village on Route 114, then turn right on Parker Station Road and go another 0.1 mile. The building is on your right. Overflow parking is on your left. Uncanoonuc Mountains, north and south, with an elevation of 1,321 feet. A toll road was built up the mountain in 1877. Beginning in 1907, a train scaled the southern peak, carrying summer visitors to recreation trails, a hotel and summer homes. In the 1930s and 1940s, the train was used to take skiers up the mountain to the ski trails. 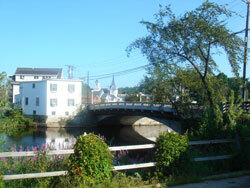 The Piscataquog River runs through the byway towns of Goffstown, Weare, and New Boston. It’s not only appreciated for its scenic value and wildlife, it’s also ideal for canoeing and kayaking, boating and fishing. In Weare the river is impounded in the Weare Reservoir and Everett Lake. From Goffstown, drive north on Route 13 (High Street) to Dunbarton Center.